Today is your lucky day, as I am here to share with you some of the best-patterned ankle pants to wear this year. You are about to see fun patterns, bold designs and shiny details that will ideally work with blouses and your favorite reladed-fit dresses. This is your one and only inspirational compilation that includes stunning designs for parties, casual walks around town and other activities. I guess you already want to know more information about these perfect bottoms, if so, then you are more than welcomed to find out more by scrolling down your mouse. This 2018 year is all about those extreme experimentations that are full of bold prints and vibrant colors. Of course, these pants should be styled correctly, if you want to make them look good on you. First thing what makes them look awesome is the pairing of footwear. You can go from slouchy ankle boots to classic pumps, ballet flats, and heeled loafers. Personally, I like to make experiments with vibrancy, by pairing printed pants with various tops, starting from boxy silken plain color tops to classic polka dot shirts and houndstooth print cocoon-style cardigans. All the showcased outfits will easily take you from day to night. All in all, I think it’s the right time to have a look through some of the best street style images and make some notes, right? Here we see a stylish combo that includes a neutral black color slim pullover teamed with gingham print slim trousers. Love the beige heeled pumps. If you want to see other ways how to wear gingham print, then I highly recommend to check my post, as I gathered lots of cool ideas that can easily inspire you. Keep it fresh and preppy! Go for a grid print gray pullover worn over white shirt styled with houndstooth print skinny pants and white heels. If you want to know more ideas how to wear white heels, then be sure to check my article about ways to wear white heels this Summer. 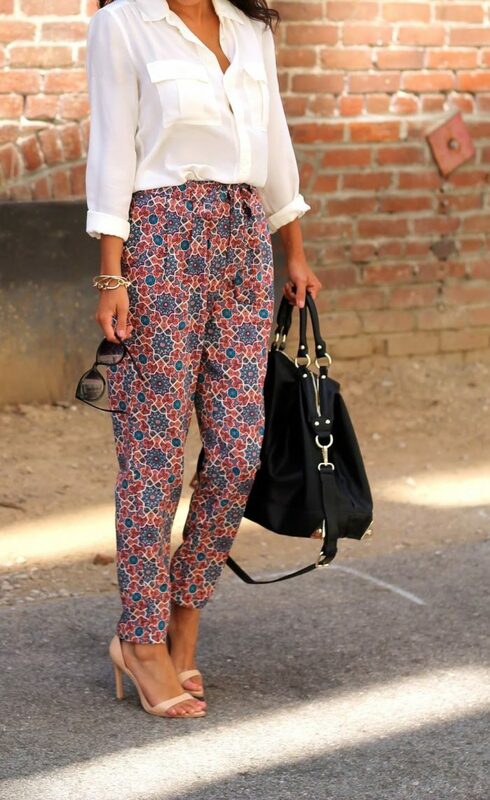 Do You have any thoughts about Patterned Ankle Pants For Women? Here are Fashion Tips pictures and trendy women’s outfits which are in style in 2019: Ankle Pants, Patterned Ankle Pants, Printed Pants, Prints Trends, Street Style Women's Fashion And Inspiration and tips on how to wear them on the streets.